Today I've teamed up with some fashionable blogger friends to share ways to style rain boots for spring! We usually get a lot of spring rain around here, so a good pair of rain boots is a must! I got these black Hunter Rain Boots in the fall and I really have gotten SO MUCH wear out of them. Hunter Rain Boots come in many colors and sizes and you have the option of glossy or matte. I went with the black matte so they match everything, but if I ever get another pair, I'm going for the red! For reference, I'm usually a 7.5 shoe size and I'm wearing a 7 in these (they only have half sizes). I kept this spring outfit casual by wearing a lightweight long sleeve tee and a utility vest over top. I've had my eye on olive utility vests for awhile and I finally found the perfect, affordable one at Kohl's! This Mudd Utility Vest comes in olive and ebony and is on sale for $32.99! Plus, if you are a regular Kohl's shopper (like me) then you know to shop with coupons and get an extra percentage off! If you sign up for the Kohl's charge card, you get coupons for up to 30% off in the mail. Anyway, this vest is perfect for spring. It's light, comfy, and stylish. I love that it zips and buttons in the front and it comes with a hood so you'll be ready for those rainy days! I also really like the cinched waist...gives you a little shape and is very flattering! I wore the vest over my striped 3/4 sleeve tee from LOFT. I purchased this in the fall, but they have a similar one on sale with an extra 30% off right now. You could pair any long sleeve or short sleeve shirt under this vest...from stripes to solid colors. I felt like this outfit needed a little color, so I accessorized with my new favorite statement earrings from Baublebar. These sold out fast, but they have a similar pair still available that I really love. 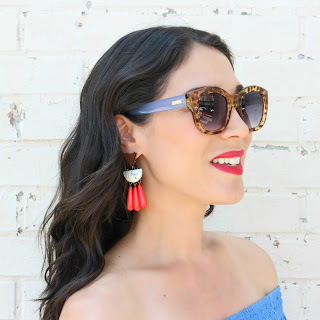 Baublebar has so many fun spring/summer statement earrings right now...check them out here. All other jewelry details are linked below! I love the way my black BP. Double Stud Crossbody Bag looks with this utility vest. The whole outfit is very casual, so a small, simple bag is a good choice. It's available at Nordstrom for only $32 and comes in cognac, too! Love this look and the pop of color in the earrings is fabulous!! Super cute, adore the vest!!!! I need some hunters, they're on my "wish list"
So so perfect. I am obsessed with your vest and the earrings did add the perfect pop! I love everything about this look for spring! Just pinned it and am sure I will be recreating it soon. Thanks for the inspiration! You're welcome!!! Thanks for the nice comment and pin! :) Happy Easter!